This tutorial will explain how to use the Child Theme concept to customize a WordPress Theme. Specifically, this tutorial will explain how to create a Child Theme to hold future-proof Theme customizations, and then will explain how to build a custom Page template within that Child Theme. This tutorial is based on the Oenology Theme. A brief background: recently, a user of the Oenology Theme contacted me, asking how to create a custom Page template. Specifically, this user wanted to have content of a particular Page display in a single, wide column with no sidebars. This customization is quite easily implemented using a Child Theme, as I will explain. The first step is to create a Child Theme. In its simplest form, a Child Theme doesn't have to be anything more than a single file: style.css. While some Child Themes are much more complex, all start with this one file. WordPress will use two critical pieces of information from the Child Theme's style.css file to do all of the rest of the heavy lifting: a header tag and a file import. Inherit styles from oenology parent theme. Congratulations! You just created your first (fully functional) Child Theme! 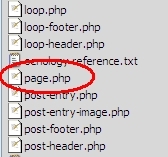 In other words, if we don't add an "index.php" template file to our Child Theme, WordPress will use the "index.php" template file from Oenology. And that's it! That's all the information that must be provided for a working Child Theme. At this point, you could simply FTP your newly created style.css file to \wp-content\themes\oenology-example-child-theme\, and you'll see your Child Theme appear under Themes in your WordPress admin. You could activate your Child Theme at this point, and it would work (it would just look and act exactly the same as its Parent Theme, Oenology, at this point, because we've not yet added any customizations). But, let's make our first customizations first. Now the real fun begins! Let's create our custom Page template. 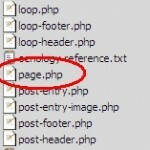 Start by making a copy of the "page.php" template file from the Oenology Theme. 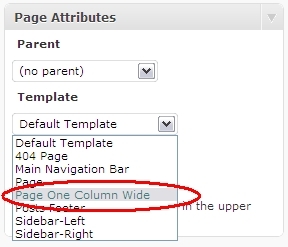 Since the custom template we want to create is a wide, one-column page, we will name our copy "page-one-column-wide.php". Important! At this point, we are done with the Oenology Theme. Be sure not to make any changes to the Oenology Theme template files. Likewise, do not save your Child Theme's "style.css" file or any other file in the Oenology Theme directory! Save "page-one-column-wide.php" in the same directory where you saved "style.css", and then open it in your text editor of choice. Add a custom class to the HTML <body> tag. This change tells WordPress to add the CSS class "page-one-column-wide" to the HTML <body> tag. We will use this CSS class to define our custom style for our template. div#leftcol contains the left column content of the three-column layout. For index.php, sidebar-left and sidebar-right both appear to the right of the main content column. For page.php, sidebar-left is to the left, and sidebar-right is to the right, with the main content column in the center. div#rightcol contains the right column content of the three-column layout. Here, we simply remove the code that adds the Sidebars to the template, so that they do not display. That's all we need to do with the template file. Save your changes, and we will move on to styling our new Page template. Be sure to make all additions beneath this line. This rule is very important. The first rule changes the width and margin of the main content area, so that it takes up all the space made available by the removal of the sidebars. The second rule ensures that any pictures that are added to the content will take up the full available width. At this point, we're done make edits to Theme template files. Now the fun begins: using our new Child Theme, and custom Page Template! 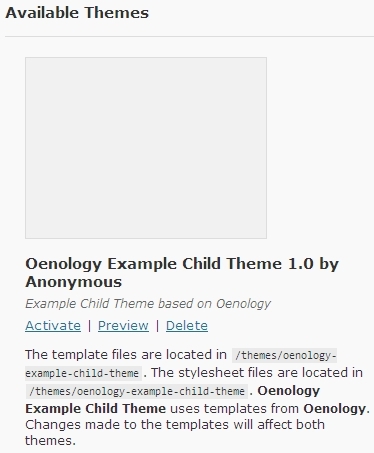 As demonstrated previously, the Child Theme will now appear in the Themes section of the WordPress Admin area, and can be activated like any other Theme. Why? Because you've not made any changes to any of the default content, templates, or styles. 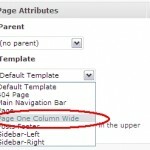 You will need to tell WordPress to use your Custom Page Template for a Page in order to see the changes. I've also uploaded a ZIP file containing the example files "style.css" and "page-one-column-wide.php" used in this tutorial: oenology-example-child-theme.zip. Feel free to use however you'd like! If you have any questions, please don't hesitate to ask. Though, I would prefer that you ask them in the Oenology Support Forum at wordpress.org, where official support for the Oenology Theme is provided, rather than in the comments. Good luck, and happy Child Theming!